When I decided to get more serious about playing golf, I figured I should take advantage of some of the new technology. Cleve started by asking me a series of questions and then studying my swing. He then put together a set of clubs to meet my specific needs at a very reasonable price. Along the way, he gave me a few tips on my swing and grip. I have seen an immediate improvement in my game and anticipate further improvement as he works with me to further adjust the equipment to my needs. Cleve has done excellent work for me, and he has provided better turn around time, by far, than I can get elsewhere. I’ve had him replace shafts (graphite and steel) and grips on numerous irons and metal woods. He’s turned graphite shafts so the spine was positioned properly for consistency. I bought the parts for a new putter and he put it together for me. He even painted my Scotty Cameron putter so it wouldn't’t reflect sunlight in my eyes. He’s offered to deliver the finished product to my home, although I’ve usually preferred to pick it up. I recommend him highly. I am 56, an 11 handicap and losing distance on my drives. Cleve Porter at The Golf Club, Inc. made a new driver for me which is going 20+ yards longer. It is the best feeling at impact and sounding driver I have ever had. I may never get back to my lifetime low of a 4 handicap but I am having fun again and should see a single digit soon. As a regular client of The Golf Club, I was informed that they were preparing a new web site so I asked if I might make a comment or two, so these remarks are unsolicited. 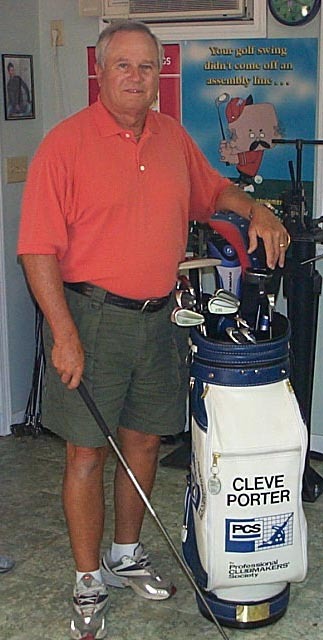 I have known Cleve for quite a few years and over that time have observed his passion for the game, so when I found out that he was going to make and repair clubs I wanted to see his work. What I did not know but should have was that the passion that he has for golf shows up in the quality of his work. On separate occasions, I asked Cleve for special help for two friends, professionals, Gary McCord and Jerry Heard, who were in town and on a short schedule. Not only was the work completed timely (less than a day) but the workmanship exceeded both of their expectations. I would recommend Cleve Porter and The Golf Club to any obsessed golfer.